Israel's 84-year-old president has a novel idea on how to battle anti-Semitism: Facebook. Shimon Peres told a group of international students on Tuesday at Israel's Holocaust memorial that the popular social networking site was an effective means to counter the spread of hate and incitement on the Internet. "Anti-Semitism is a disease of everyone. Persecuting minorities, discrimination, xenophobia and violence exist in many countries in the world," he told a group representing more than 60 countries, who gathered at Yad Vashem for an international youth conference about the Holocaust. "You have the opportunity to teach your friends about the memory of the Holocaust so that these horrors will never be forgotten and will never be repeated." 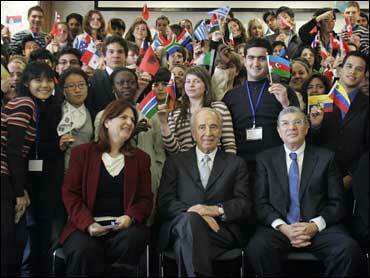 When asked by one of the youths what each of them could do, Peres replied: "Who here has heard about Facebook?" Nearly all in attendance raised their hands. "You can fight anti-Semitism using social networks, like Facebook," he continued. Peres spokeswomen Ayelet Frisch said that Peres met last week with Facebook founder Mark Zuckerberg at the World Economic Forum in Davos, Switzerland. Peres, who spearheaded the establishment of Israel's cutting edge aerial industry and introduced computers into its military, has long been an active supporter of high-tech ventures. He is currently behind an initiative to install the world's first electric car network in Israel. He also maintains an active Web site and has a blog on the Web site of the Israeli daily Haaretz. Peres does not have a Facebook profile, but Frisch said he is considering doing it.